The crested newts are large (up to 18 cm; 7 inches) heavily-built newts. They have a somewhat warty skin, quite unlike the smooth or granular skin of smaller species, such as the Mesotriton and Lissotriton. The back is dark brown or black, and there may be white stippling along the flanks. The belly is usually yellow or orange, with large black blotches or spots. The males develop a high, toothed, crest during the breeding season, and a white band along each side of the tail. T. karelinii male with crest. The four species are very similar in appearance - they were formerly all considered subspecies of T. cristatus. There are some differences between the species that help distinguish them. The throat of T. karelinii is yellow or orange with black spots, similar to the belly colouration. The other species have a predominantly dark throat, usually with white spots. T. cristatus and T. dobrogicus have much white stippling on the flanks- the other two species have little or no stippling. T. carnifex females almost always have a bright yellow vertebral stripe- a stripe is very rarely present in T. cristatus females. If present, it is less bright (more orange or brown) in T. karelinii and T. dobrogicus. T. dobrogicus is much more slender than the other species, and the breeding male has an extremely high crest. The crested newts range over the whole of mainland Europe, with the exception of southwest France, Spain and Portugal (where they are replaced by the closely related Marbled newts, T. marmoratus and T. pygmaeus) and northern Scandinavia. They are also found on the mainland of Great Britain. Outside of Europe, they are found in northern Turkey, northwest Iran, and parts of the former Soviet Union. The ranges of each species are as follows. T. cristatus: Austria, Belarus, Belgium, Czech Republic, Denmark, Estonia, France, Germany, Latvia, Liechtenstein, Lithuania, Luxembourg, Moldova, Montenegro, Netherlands, Norway, Poland, Romania, Russian Federation, Serbia, Slovakia, Sweden, Switzerland, Ukraine, and the United Kingdom. T. carnifex: Albania, Austria, Bosnia, Herzegovina, Croatia, Czech Republic, Germany, Greece, Hungary, Italy, Macedonia, Montenegro, Serbia, Slovenia and Switzerland. Introduced into the Netherlands, Portugal (Azores), and the United Kingdom. T. karelinii: Azerbaijan, Bulgaria, Georgia, Greece, Iran, Macedonia, Montenegro, Russian Federation, Serbia, Turkey, and the Ukraine. T. dobrogicus: Valleys of the Danube and Tisza River systems in Austria, Bosnia, Herzegovina, Bulgaria, Croatia, Czech Republic, Hungary, Moldova, Montenegro, Romania, Serbia, Slovakia, and the Ukraine. These species are all able to interbreed, and so the edge of the distribution of each species is hard to determine. They can also breed with T. marmoratus, and natural hybrids (once referred to as T. blasii) occur at the overlap of the range of T. marmoratus and T. cristatus in northwest France. Due to decreases in wild populations, caused mainly by habitat destruction, all of the crested newt species are protected by the European Habitats and Species Directive of 1992. This requires European states to protect the species in the wild, and to regulate trade of wild-caught animals. At the time of writing (December 2002), the only species generally available as wild-caught individuals are T. cristatus and T. karelinii, which are exported from the Ukraine. Captive bred specimens of T. carnifex, T. cristatus and T. karelinii are widely and frequently available in Europe, more sporadically in North America. T. dobrogicus is available extremely rarely, though it is bred by some European hobbyists. To avoid depleting wild populations, captive bred stock should be purchased in preference to wild-caught. The four species all have similar habitat requirements. They prefer medium to large, well vegetated, still or slow-flowing water bodies, with surrounding terrestrial habitat in the form of scrub, long grassland or woodland. 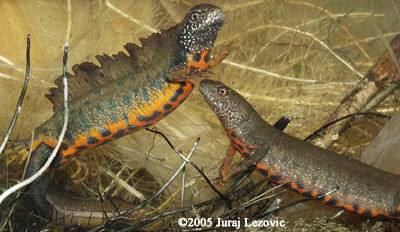 Crested newts breed in the spring, producing larvae which usually metamorphose by the autumn. 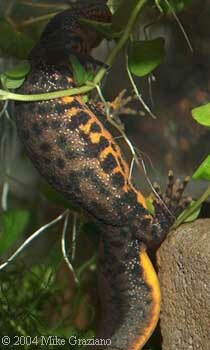 Most adult newts leave the water for terrestrial habitats in late summer, though some remain in the water all year round. 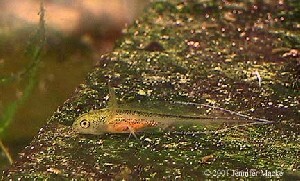 Similarly, most juveniles leave the water at metamorphosis. The adults return to the water to breed each spring, and some juveniles also enter the water at this time, despite being too young to breed. Crested newts are hardy, robust newts that are very easy to maintain in captivity. They are tolerant of many different environments, and relatively easy to breed and rear. It is possible to maintain crested newts according to their natural cycle of aquatic and terrestrial life, or to maintain them aquatically all year round. An aquatic or terrestrial setup should be no smaller than 45x30x30 cm (18x12x12 inches) for two pairs. It is possible to create a semi-aquatic setup, which will accommodate both aquatic and terrestrial habitats. This would need to be correspondingly larger, in order to provide enough of each habitat. Depending on the space and resources available to the keeper, it may be easier to have a separate setup for each mode of life. 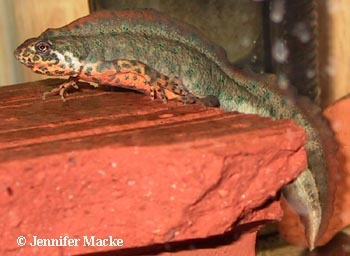 Some people keep these newts in outdoor enclosures - they live very successfully this way in temperate climates. However, great care must be taken to prevent escapes, especially where a crested newt is native to the area, as escapees may interbreed with local populations. T. dobrogicus male with crest. An aquatic setup may be as simple or as complex as the keeper requires. A bare minimum could be a bare tank with floating Elodea (Egeria densa) plants, and a few pieces of broken clay pipe for the newts to hide under and to aid skin shedding. A more complex setup may incorporate filtering or permanent planting. A filtered setup will require less cleaning, but will be more expensive and complex to set up. Crested newts are generally pond dwelling animals, and are only very rarely found in flowing water, so if any filtration is provided, it should be ensured that the water remains relatively still. 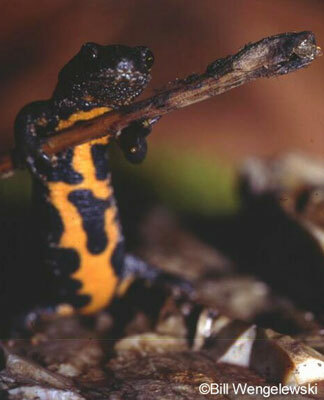 Temperatures should be less than 25ºC (75ºF) - higher temperatures may induce the newts to attempt to leave the water. Crested newts will remain fully active down to around 10ºC (50ºF). Artificial lighting is not necessary for the benefit of the newts, as they are mainly nocturnal in the wild. However, it may help with breeding, and may be necessary for plant growth. Crested newts are tolerant of a wide range of water conditions, though chlorine in tap water may be harmful to them. Tap water that has been aged for a few days to reduce chlorine levels should certainly present no problems. 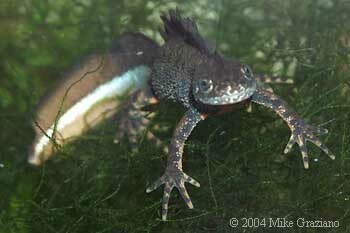 Though crested newts may be found in very deep waters, a depth of 15 cm (6 inches) is adequate in captivity. The main consideration in a terrestrial setup is that it should not become too dry or too wet, and that adequate ventilation should be supplied. Carbon dioxide poisoning from poor ventilation has recently been identified as a cause of death in captive frogs, and inadequate ventilation may also encourage fungal infections. I personally make my own vivarium lids from muslin taped on to a frame made from L-shaped plastic profile. This provides excellent ventilation, and prevents escape of even the smallest live foods. It also allows light through, so that artificial lighting can be provided outside the tank. The easiest way to maintain appropriate water content is through use of a water-retaining substrate. If a layer of potting compost several centimetres deep is provided, and sprayed regularly, it will retain water for some time. If it is sprayed at one end, then a humidity gradient will result, and the newts will be able to choose the water content they prefer. A layer of moss can be placed on top, so that the newts will be able to hide beneath the moss, rather than being exposed on the surface. Pieces of bark or stone may provide extra hiding places. More sterile setups have been used with some success with various newt species, using a substrate of tissue paper or foam rubber for moisture retention. These need rather more care to maintain water content, as they will dry out more quickly than a deep compost-based substrate. Crested newts in the aquatic phase will take a wide range of foods - appropriate live foods include earthworms, freshwater shrimp, bloodworms, daphnia and whiteworms. Non-live foods will also be taken, though these may have to be presented to the newt with tweezers, at least at first. Such foods may include frozen bloodworm, fish food pellets, or reptile pellets (e.g., 'Reptomin'). A variety of foods should be offered where possible. If a varied diet is provided, vitamin or mineral supplements should not be necessary. However, foods such as waxworms or crickets may be gut-loaded for extra nutritional content. 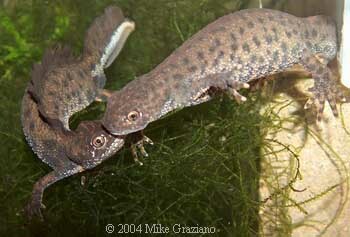 Aquatic crested newts have a very strong feeding response, and will often snap at other newts while feeding. This rarely results in injury among newts of similar size, but it does mean that newts of differing sizes should not be housed together. Smaller amphibians do form part of the diet of crested newts in the wild. In the terrestrial phase, feeding is a little more difficult. Non-live foods will not be so readily taken, but live foods such as earthworms, waxworms or whiteworms can be used. Small insects such as fruit flies or small crickets may also be appropriate. For breeding to be successful, it will be necessary to have healthy adults of both sexes. They must build up their reserves over the summer in order to reproduce successfully the next spring. Though females will take vast amounts of food, males should not be overfed. Distinguishing the sexes is relatively easy at all times- males have large cloacae, and are relatively slim. Females are much stockier, and may appear pear-shaped. When the animals are in breeding condition, it is unequivocal- males have high toothed crests, and a white flash along the sides of the tail. To stimulate breeding in crested newts, it is necessary to have a colder period over the winter months. It is not necessary to drop the temperature as low as that which would be encountered in nature- six weeks at 10ºC (50ºF) should be sufficient to bring animals into breeding condition. However, temperatures as low as 4ºC (40ºF) should not harm the newts. Feeding should be reduced over this period. If very low temperatures are used, feeding should be stopped completely about one week before the newts are exposed to the low temperature, to ensure undigested food does not decompose in the gut. After this colder period, the animals can be placed into an aquatic setup at 15-20ºC (60-70ºF). Other stimuli that may help induce breeding behaviour, other than a rise in temperature, may include increased light levels and an increase in feeding, especially of live food. Males will develop crests within a few weeks, then courtship behaviour will start. They may be aggressive towards other males at this time, especially if overcrowded. Though injuries do not usually result, it may be wise to remove 'bullied' individuals. Males will display to the females with tail waving and lashing, arching of the back, and crest waving. There must be an open area provided on the floor of the aquarium for this display to take place. A successful display will result in the male depositing a spermatophore on the substrate, and leading the female over it, so that she is in position to take it into her cloaca. She will then begin to lay eggs within a few days, and continue for several weeks, producing as many as several hundred eggs in total. In the wild, eggs are laid on the leaves of aquatic vegetation. The female selects an appropriate leaf by 'smelling' it. She folds this leaf with her hind feet, lays an egg into the fold, then presses the leaf tightly over the egg. The stickiness of the egg holds the leaf in the folded position. In captivity, it is necessary to provide appropriately sized leaves. Elodea (Egeria densa) has leaves of around the right size, as does Water Forget-Me-Not (Myosotis). Strips of thin plastic sheeting, about 1 cm (0.5 inch) wide, make a good substitute. I have found that crested newts are more likely to lay eggs where vegetation is very thick. It is best to remove the eggs for separate rearing, otherwise the parents may eat the eggs or larvae. It is very easy to identify the folded leaves that contain eggs, and break them off for removal. 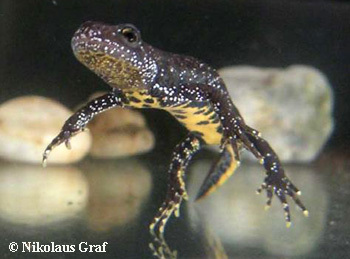 Crested newts, along with the marbled newts (T. marmoratus and T. pygmaeus) exhibit a chromosomal abnormality which results in the death of 50% of all eggs. Death occurs within 1-2 weeks, and dead eggs will usually be infected with fungus very quickly. Once this happens, it is best to remove them, lest they infect healthy eggs. Eggs will hatch within 2-3 weeks. The larvae are carnivorous from the time they have absorbed their yolk, a few days after hatching. From then on, it is necessary to provide them with live food. Infusoria is a good start - this can be cultured by boiling a lettuce leaf in a small amount of water, and leaving it in this water for a few days. The resulting cloudy water contains millions of organisms that can be fed to tiny newt larvae. Good foods to continue with are Cyclops and baby Daphnia. Cyclops can often be unknowingly cultivated in aquatic setups- the parents' tank may contain some which can be used to feed the young larvae. As the larvae grow, they will take larger Daphnia, whiteworm, and bloodworm. Some people have had success feeding them on non-live food, using frozen bloodworm or even fish pellets. It is critical to provide enough food - larvae should be fed daily where possible, though adults may be fed only twice a week. Large larvae are extremely voracious, and will attack each other if underfed or overcrowded. Larvae of the crested newts mainly feed in mid-water, unlike those of the smaller Triturus species, which mainly feed on the bottom. This means that it is desirable to provide mid-water vegetation for them to hide in. Water depth of 10-15 cm (4-6 inches) should be sufficient for larvae. Though the larvae are relatively robust, they are much more sensitive to water quality than the adults, and will require frequent water changes. Metamorphosis takes place within 8-16 weeks, depending on food supply and temperature, at a size of 5-8 cm (2-3 inches). Metamorphs should be allowed to leave the water at least partially, in order to prevent drowning. If it is desired to raise them aquatically, it is usually sufficient to keep them in a predominantly aquatic setup, and feed in the water - they will grow used to staying in the water. They can, of course, live terrestrially, as they would in nature. Feeding and housing is essentially identical to that of the adults, though smaller food must obviously be provided. Young newts can eat very large quantities of food, and if fed sufficiently, may grow to adult size in one year. Two years is a more common time to reach adult size in captivity. Triturus carnifex Developmental Photo Series. Arnold, E.N., 2002. A Field Guide to the Reptiles and Amphibians of Britain and Europe. Collins, London. Baker, J., 1988. 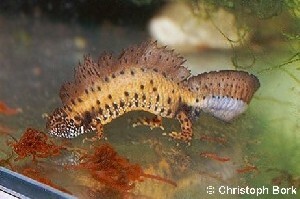 Maintenance and Breeding of Triturus karelinii. British Herpetological Society Bulletin 25: 42-44. Cogalniceanu, D., 1989. Reproduction twice a year of the Crested Newt in Captivity. British Herpetological Society Bulletin 30:12 -13. Elebert, E., 1991. Precocious Newts. British Herpetological Society Bulletin 35: 17-19. Falk, T., 2001. Carbon Dioxide in the Terrarium. British Dendrobatid Group Newsletter 41: 1. Griffiths, R. A., 1996. Newts and Salamanders of Europe. Poyser Natural History, London. Jones, M., 1985. Breeding Great Crested Newts Triturus cristatus cristatus in an outdoor enclosure. BHS Bulletin 11: 29-31. Waights, V., 1995. Captive maintenance of adults and juveniles of the genus Triturus during the terrestrial phase. Alytes 13(2): 77-80. © 2002 Caleb Leeke. Posted December 2002.